Antonia’s Studio 4, 925 South St, Peekskill, NY. 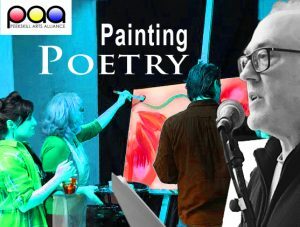 “Painting Poetry” showcases the creative collaboration between painters of the PAA and poets of the surrounding areas. Interacting together, poets read while artists paint in immediate response to what they are hearing. This program will include 6 poets and 9 artists who work in small teams. When the poets read, the painters respond with color, shape and expression. Watch the painters make tangible the feeling within the spoken word.